Clothes: Your 3-6 month clothes are still fitting very comfortably. I'm trying really hard to get you into 6-12 month clothes, because (even though I want you to be tiny forever) last year I bought a bunch of fall/winter clothes (on sale!!!) that are 6-12 month. However, they are quite enormous on you, my little peanut. I have a feeling we will either be "winterizing" your 3-6 month summer clothes (with cardigans and leggings) or doing some major pant- and sleeve-rolling this winter! As far as diapers, we are finishing this last pack of size 2 (which will most likely happen, oh, today), and then you will be in size 3. Milestones: I feel like we just hit milestone after milestone this month! 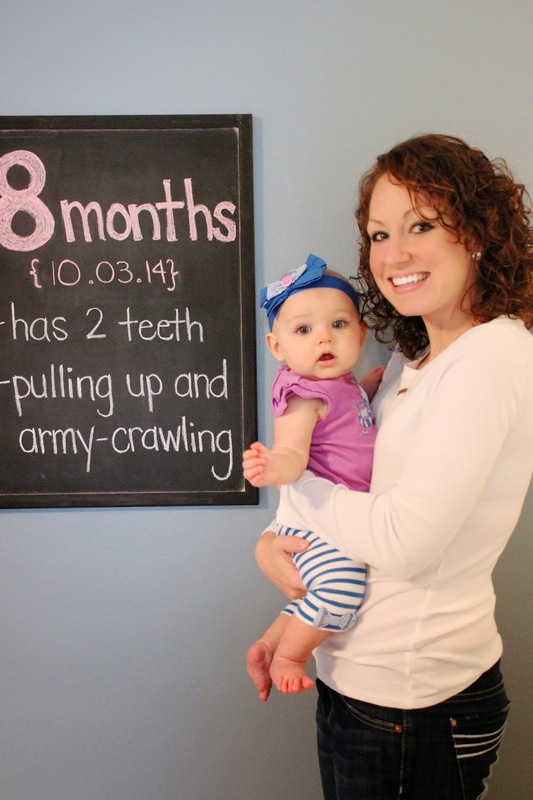 You got your first 2 teeth, you are pulling up on anything and everything, and you are slowly army crawling/pulling your way across the floor. While the army crawling is just beginning to get you somewhere, you don't really have any interest in "real" crawling. If something is too far away, you just roll over and sit up, and cry for someone to move you closer! You would much rather "walk." Your favorite thing to do is stand...and you are getting really good at it! You can stand almost all by yourself (you only need to hold onto something with one hand). I have a feeling you might be an early walker?!? Good thing our house is about 80% baby-proofed (we still need to anchor down some furniture and get a baby gate for the bottom of the stairs)! Sleep: Well after Nap Strike 2014 last week, I am happy to report you are back on track and are no longer taking 20 minute naps! Morning naps are definitely still not your fav, but I can usually get about 45 minutes out of you. During your afternoon nap, you sleep anywhere from 1 to 3 (!!!) hours! It's kind of amazing. At night, you go down at 8 PM (sometimes a little earlier if you haven't napped well) and you are starting to wake up a little bit earlier...anytime between 7 and 8 AM, but lately it's been closer to 7. Best Moment: I have a few! Watching you pull up for the first time, and going apple picking/tailgating in Clemson! We had a fun month! Worst Moment: When you were so sick at the beginning of the month. Ok, I'm being dramatic. You weren't so sick, you just had some bad allergies and maybe a cold, combined with teething...but it was pretty miserable. We even missed a UNC game, which if you know your dad, is major. Second place for worst moment would be the entire week you decided 15 minutes was an acceptable length of a nap. Likes: Still obsessed with the remote, iPads and cell phones, when we open the garage door (you can just sense the adventures we're about to embark on! ), touching people's faces, empty Gatorade bottles, riding in the shopping cart, pulling up on EVERYTHING, putting anything you can in your mouth and chewing on it, bouncing/singing/dancing/"flying" on mommy's knees. Dislikes: Well, you are liking the YMCA a little bit better, but there are some ladies who work there that you are still not fans of for whatever reason...you also dislike teething (as do I! ), peas, falling down, and when I move something too far away from you (I'm trying to get you to crawl!!). Health: You had some nasty crud earlier this month, but after lots of steaming, some Zarbee's and Baby Vicks, tons of Nose Frida-ing and sleep, you felt better within a week! Other than that, and the stupid pain that comes along with teething, you've been a picture of perfect health the rest of the month! Eating: We have tried lots of new foods this month! You liked: butternut squash, acorn squash, apples, prunes, sweet potatoes, mangos, and green beans. You did not like: artichokes and peas. We also had some store bought baby food. I am only buying the super organic labels, where the only ingredients are the actual fruit/vegetable and maybe a little water or lemon juice (no other preservatives/crazy ingredients I can't pronounce). You like every pouch you've tried, and you seem like them better than my "cooking!" HA! You've also had Puffs (apple cinnamon) and Baby Mum Mums...you like them both, but the Baby Mum Mums are easier for you to grab and eat. As far as breastfeeding, we are still going strong, with you nursing every 3-4 hours. When you get a bottle, you take 6-8 ounces, and I still haven't given you any formula--I'm pretty proud of us! Let's keep this up for just 4 more months (AAHH! ), k?! 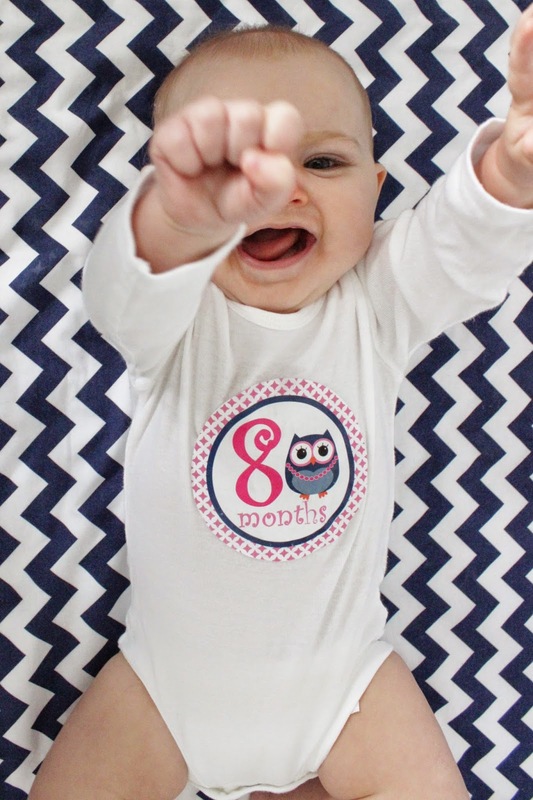 Can't believe she is 8 months!